I read about the town of Taal, Batangas and its treasures earlier last month. I decided to go there with my family to experience first hand the old churches, the preserved colonial houses and of course, the local cuisine. Going to Taal is a cinch. It's a two to three hours drive from Manila. We went there on an early Sunday morning so traffic was relatively easy. We took the South Luzon Expressway and exited through Sta. Rosa. We headed for Tagaytay City and took the road leading to Lemery, Batangas, which is a very scenic route because you can see Taal Lake and its volcano on the left side. One must really be familiar with the place because there are very few signage pointing the direction to Taal town. Our first stop was the Taal Basilica or the Basilica de San Martin de Tours . The church, made of adobe and coral stones, is considered the biggest Catholic Church not only in the Philippines, but in Asia. It was first built in 1575 by Fr. Diego Espina of the Augustinian Missionaries in what is now the town of San Nicolas. It was destroyed by the eruption of Taal Volcano in 1754 and transfered to its present site in 1755. It was destroyed yet again in 1849 by a powerful earthquake. Construction of the new church began in 1856 and was completed in 1878. It was declared a minor basilica in 1954. While the exterior of the church is already awe inspiring, the interior is even more beautiful. Artwork covers the arches and column of the building. The altar is also a sight to behold, with its tabernacle fashioned out of silver. 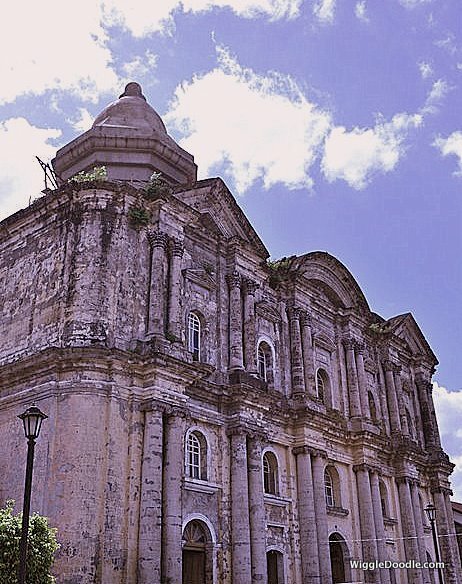 It's also good to know that this basilica has withstood the test of time through efforts of the people of Taal. It is something that we Filipinos should really proud of. 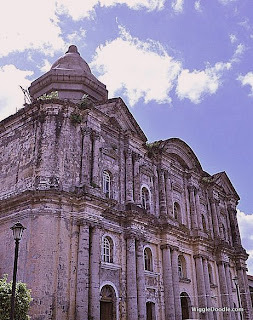 Another must see church in Taal is the Our Lady of Caysasay Church, which sits beside the San Lorenzo Ruiz Steps. It is the shrine of the image of Our Lady which was fished out of the water by a native named Juan Masingkad in 1603. Historical accounts say that when the image was found, it was given to a widow of a town official who placed it in an urn specially made for Our Lady. However, the image would disappear at night, only to reappear the following morning. This happened several times until the image disappeared one day and never found. Years later, some women saw a reflection of the image in the river where it was found. They looked up and saw her on a tree. The women reported what they saw to the parish priest who concluded that the image wanted to stay in Caysasay. In 1611, a church was built on the spot where Our Lady was found. The story of Our Lady of Caysasay, including her apparitions to some native girls, is depicted in a series of murals inside the church. The image of Our Lady of Caysasay is encased in glass above the altar, with images of two angels on either side. 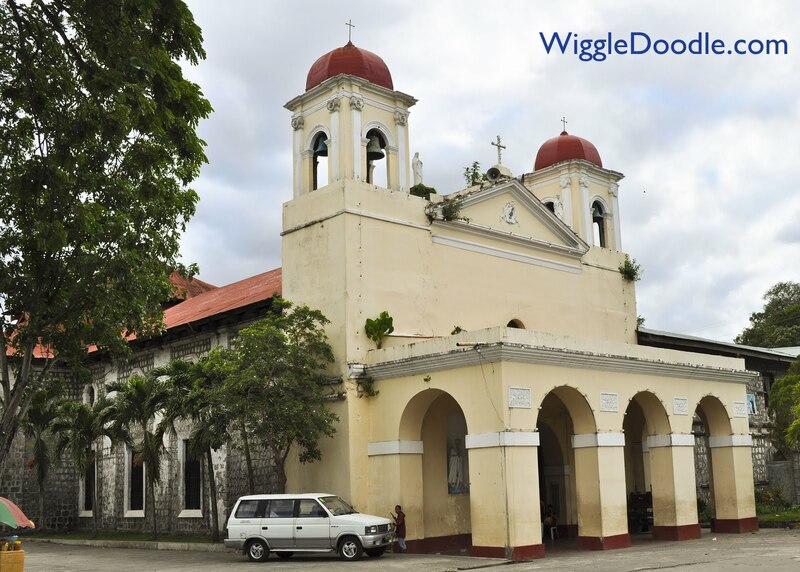 While the church may be smaller than the Taal Basilica, it is still filled with folk art. Aside from the murals depicting the discovery and apparitions of its patron, visual representation of the passion of Jesus Christ fill the nave. Just above the image of the Lady is a painting of the crucifixion. The painting on the ceiling of the dome of the church depicts the Resurrection of the Christ on Easter Morning. The people of Taal still believe that the Lady saved their town from the violent eruption of Taal Volcano in 1754. In 1954, she was canonically crowned at the Basilica of St, Martin de Tours by the representative of the Pope. I like to visit this church as well as the other old churches in the area. thank you sa pag describe ng both churches it helped me lot in my report..